Last week’s deadly earthquakes in Japan, which shut down most of Toyota Motors’ Japanese factories until April 23, are a reminder why automakers need more than one source of production for popular models. A shortage of supplier parts, for instance, has interrupted exports of Lexus vehicles, including the hot-selling RX and NX crossovers and the newly redesigned ES sedan. Luckily, the RX is also manufactured in North America, at Toyota’s Cambridge, Ontario, plant, which could help offset some of the lost production if necessary. And, for the first time, Lexus is now building the ES in the United States at its flagship Georgetown, Ky., plant. At 8.1 million square feet, Georgetown is Toyota’s largest factory in North America, cranking out more than 500,000 vehicles a year. Independent research recognizes it as one of the top manufacturing plants in the world for quality and productivity. So Georgetown’s 7,500 or so workers know a thing or two about building first-class automobiles like the Camry, Avalon and Venza. But to assemble the first U.S.-built Lexus, they had to raise their game — and elevate their senses. The 750 employees picked to work on the new Lexus line underwent 1.5 million hours of additional training, which included special sensory development activities so they could see, hear, feel and smell what a Lexus should be. Some employees traveled to Japan to learn the art of Lexus craftsmanship from a group of 10 master craftsmen called the Takumi who oversee all Lexus manufacturing. They also spent weeks repeatedly tearing down and rebuilding 22 cars purchased from a Kentucky dealership to familiarize themselves with every one of the ES’s 2,000 parts. 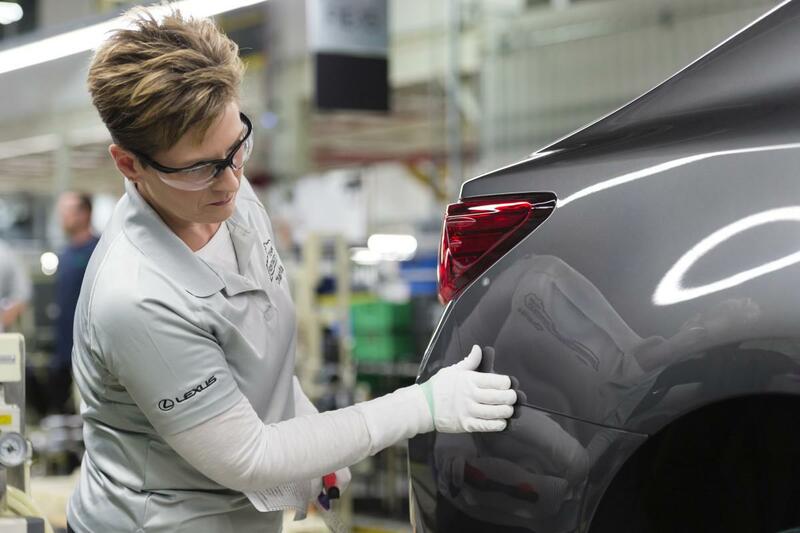 To understand Lexus customer expectations, factory workers also spent time driving the new ES on the back roads of Kentucky and visiting Lexus dealerships. I got a first-hand look at Lexus manufacturing (and the training process) during a recent visit to the sprawling Georgetown factory, where Toyota launched ES production last October after a $360 million investment. The biggest difference between the Lexus assembly line and the rest of the Toyota plant is the speed of the operation. In mass manufacturing, workers do one or two tasks repeatedly, as cars move in succession down a conveyor. It’s a fast-paced process: a Camry or Avalon spends just 54 seconds in each work station. On the Lexus line, the so-called “takt time” (German for an orchestra conductor’s baton to keep the tempo in music) is four and a half minutes. That’s because workers perform an average of 80 steps at each work station. Each Lexus worker has to learn at least two jobs, which means they have to master 160 steps. Just remembering them all can be a challenge, which is why team leaders spend months training each worker on practice vehicles away from the assembly line until they get it right. Takumi craftsmen train inspectors to check 4,000 points on every Lexus for paint quality and scrutinize up to 250 points on a single engine part. In total, there are 26,000 tasks to build a Lexus that require special certification. Every four months, each technician must be re-certified. Production standards are higher on a Lexus than on a Toyota. For example, stamped body panels for a Camry go through a series of 13 surface checks to look for tiny defects like pimples, dimples or waves. Lexus panels are checked 34 times. To help train Lexus workers to feel unseen defects, one engineer designed a practice tool that uses suction cups to crank up (or down) the distortion of a piece of sheet metal. Running a gloved hand along the surface, a worker needs to be able to detect the tiniest aberration in the metal. (I tried, but wasn’t able to feel the flaws well enough to be certified.) Every stamped body panel is checked by hand before welding.